In October 2011, The Women’s Union of Da Nang, Vietnam, working with The Institute for Social and Environmental Transition (ISET), proposed a microcredit and technical assistance program aimed at developing storm resistant shelters in vulnerable districts of Da Nang. Due to the many coastal and flood prone neighborhoods throughout the city and a growing population of 926,000, intense storms and frequent flooding have become a harsh reality for Da Nang’s citizens. With limited resources and relief efforts being prioritized over disaster risk reduction, residents have been offered little opportunity to seek shelter from the next storm, often rebuilding after a storm with the same, flawed construction techniques as before. With funding from the Rockefeller Foundation, ISET, The Women’s Union of Da Nang, Da Nang Climate Change Coordination Office, and Central Vietnam Architecture Consultancy banded together to fill the critical gap between one disaster and the next—developing a mechanism which both rebuilds AND protects. The project was called The Storm and Flood-Resistant Credit and Housing Scheme in Da Nang City. 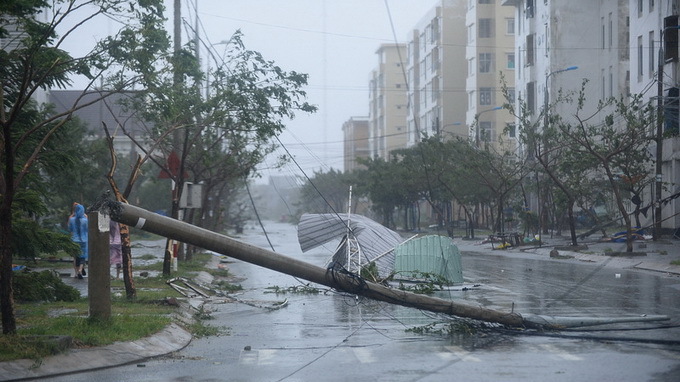 Two years later, on October 15, 2013, Typhoon Nari landed in Da Nang with level-12 winds and level-13 gusts, equivalent to 130km/h. Persistent storm winds coupled with heavy rainfall led to flooding in many areas of the city. Many people were injured, thousands of homes endured damage, and tens of thousands of trees either broke or were uprooted by the severe winds, clogging critical roadways. The Da Nang City People’s Committee reported estimate damages of up to 868.8 billion VND (~$41M USD). By the time Typhoon Nari made landfall that day, 244 of the 245 beneficiary households had completed construction thanks to The Storm and Flood-Resistant Credit and Housing Scheme. All 244 households were safe from Typhoon Nari’s force. In the time leading up to the storm, beneficiary households had strengthened their houses and prepared carefully to cope with the typhoon season. While those houses stood strong, structures all around them suffered heavy damages. This tragic event demonstrated that investment into preparation is much more effective than spending on post-disaster recovery. Our hope now is that this experience will inspire other groups and households to employ the same storm-resistant building techniques that were installed in each of the beneficiary households. Storm resistant shelter design is one of the fundamental requirements of climate resilience at the household and community level, along with access to loans to allow households to apply typhoon resistant construction techniques when retrofitting and building their houses. Important stakeholders such as professional agencies/experts still rarely participate in the construction of local low-income housing in peri-urban and hazard prone areas. Some obstacles, such as high costs of design services for low-income households and limited access to loan for housing require local governments to initiate appropriate supportive policies or subsidy programs to reduce obstacles and to bridge this gap. Other challenges lie within the limited self-sufficiency of households living in hazard prone areas, which is linked to their limited financial resources. Local governments, together with the public and private sector need to plan and implement actions for local economic development (e.g., programs for vocational training or micro-finance opportunities). To support the Women’s Union and other organizations promoting storm resistant housing, ISET-International with funding from the Climate Development Knowledge Network (CDKN) undertook a 2-year long cost-benefit analysis research project to estimate the average economic costs averted from building to storm resistant standards in Vietnam, as well as India and Pakistan. The winning team of the Vietnam Resilient Housing Design Competition was TT-Arch a firm based out of Hue, Vietnam. The picture shown at the top is a detailed description of their winning design, and the key characteristics that ISET is now recommending to households. Tags: #Resiliency, #Rockefeller Foundation, #CDKN, #CVAC, #Vietnam, #Da Nang CCCO, #Storm Shelters, #Women's Union of Da Nang.